Save that old outdoor furniture! 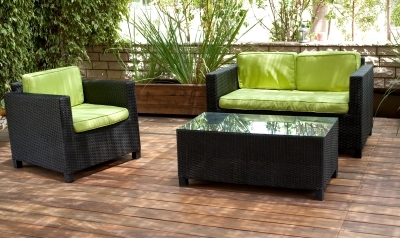 Many of us have outdoor furniture that we simply leave outside all year round. By doing so, we are exposing the furniture to the elements 24/7, 365; which can increase the wear and tear of your favorite rocker drastically. Yet instead of taking this rocker or table set to the nearest garbage dump, think about repurposing the furniture. Repurposing old outdoor furniture is easy to do, and can be done at a fraction of the cost compared to buying a brand new patio set. In fact what we will be discussing today is maybe the simplest way to make your outdoor furniture look like new, without having to be incredibly handy with tools. This is my favorite way to repurpose old outdoor furniture. Simply clean the piece of furniture you will be adding the cushions too and you can get started. While a new coat of paint, or a nice protectant finish would be great, it is not necessary for this project. This is a very simple task, as all you have to do is find a fabric that is weatherproof with a design you like. The harder part is finding the right type of cushion to place inside the fabric. Make sure that the foam you are placing inside of the new cushion is made for the outdoors, with other outdoor foam replacement options available in the same style and brand. If you are really talented with working with fabric, try to add a zipper to the cushion you just made. This will make installing an outdoor foam replacement a quick and easy task. While it may cost a bit extra in the beginning, adding this zipper will increase the length of use this particular cushion. The other nice thing about installing a zipper is that you can now wash the fabric whenever you want, even if the foam inside is not machine washable. Simply unzip the cushion, take out all of the foam, and throw the fabric into the washer. While you can throw the fabric in the drier afterwards, it is recommended to let the fabric dry on its own. Simply hanging the cushion up outside for a day should do the trick. The best thing about this is that you do not shrink the fabric in the drier, thus ensuring the foam can fit back into the cushion perfectly. The last thing we would want is for you to simply stick to the basic, safe ideas. Making a single seat cushion should be a simply enough task for your first attempt, but do not stop there. Attempt a full seat cushion that fits a rocking chair. You could also challenge yourself by creating little ties on the end of each cushion, so that these pieces of fabric can keep your cushion in place when tied together. But do not stop at just rocking chairs, think even bigger. Adding a full length cushion onto a bench is another great idea. You could even create a cushion that fits the loveseat swing on your front porch, the possibilities are truly endless. So remember, before you consider throwing away your old outdoor patio furniture; swing by the nearest fabric shop and see if anything catches your eye. Grab a few different rolls of fabric, grab some outdoor foam, and head on home to create something of your own. Extending the life of your outdoor patio furniture, if even by just a year, is a great investment. So roll up those sleeves and get to work! « Is watching TV shortening your life?